Last week’s contest was won by wes.in.wa. It was the ferry landing in the Lummi Reservation. This week’s contest is related to something in news from March. Good luck! Pre-WWII neighborhood, where ever it is. Detroit emptying out? Nah, that is too general. Fascinating false-front flat-roofed houses. Brick alleyways. Hmm. @2 – looking up brick alleys, that’s where Google sends me. 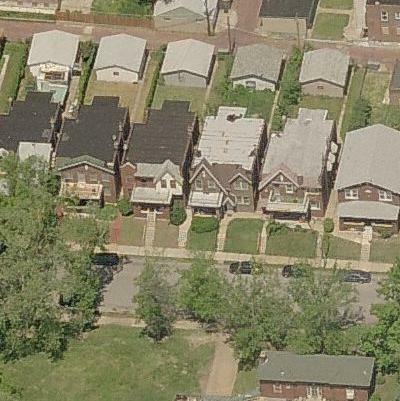 North St. Louis (where the O’Fallon neighborhood is) was exactly what I was thinking. Now, what happened in St. Louis this week? I was looking in the wrong end of town! Guess I gotta go home and visit more often! I was looking around at the shooting that was on the 5300 block of Maffit, in the north end. People on this site can locate a picture of obscure places in less than 4 hours.